Internet Access. Pool, tennis, fitness room and sauna available in the summer. The Owners of this condo have created a very special get-away for your Tahoe adventure. The entry level offers 2 bedrooms - each with a queen size bed. One of the bedrooms also has a small deck which is a perfect spot to enjoy a morning cup of tea. There is a full bath on this floor. On the second or Main level is the nicely furnished, comfortable living room with a wood burning fireplace (wood not provided), dining area and fully equipped kitchen for all of your cooking needs! 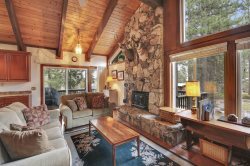 Wether you are making treats in the kitchen, sitting down to dinner or kicking back on the sofa you can enjoy the forest view out the sliding glass door. The second full bath is also on this level. HIGH SPEED INTERNET NOW AVAILABLE!! Nice townhome just off the highway from Kings Beach to Northstar. Very comfortable. Parking was easy. Will rent again. Great location in Kings Beach. Condo was cozy and as described. Great place to stay and highly recommended place for a gateway vacation. Great stay. As advertised. Very helpful info booklet with everything you need to know about the booking, home, and the local area. This place fit the 9 people in our group so comfortably. They had everything we could possibly need or want. The location is so close to King's Beach and Tahoe City (maybe a 5 min drive) and they not only provide lots of bath towels and face towels, they also had lots of beach towels that we could use when we went to hang out at the lake. They also have a giant wall full of boardgames. I wish we had more time to play them all! There was lots of parking available right outside the front door and the garbage is also right outside, making the clean up so much easier. I would definitely book here again if I'm ever in North Tahoe again.